Make your leisure time fun and enjoyable with the Xiaomi Redmi Note 6 Pro Dual-SIM mobile phone. It boasts a large 6.26inch FHD plus screen that will keep your senses engaged with its immersive, crisp, and colorful display. This smartphone features a powerful combination of Qualcomm SD636 Octa-Core processor and 4GB RAM that will help you get everything done quickly and fluidly. Moreover, the 20MP plus 2MP portrait dual selfie camera, with LED flash functionality, ensures that your captured pictures turn out incredibly crystal clear and bright. The 12MP plus 5MP dual rear camera, with dual pixel autofocus functionality, lets you capture excellent pictures any time of the day. This smartphone comes with 64GB internal memory that lets you store all your important data at one single place for easy access. Furthermore, it has 4G LTE connectivity support that ensures a quick and reliable internet connection. All the more, this mobile phone has dual-SIM functionality, which saves you the hassle of carrying different mobile devices for work and personal use. The 4000mAh long-lasting battery offers long run time, making sure you do not experience interruptions during video playback, internet surfing, and streaming. 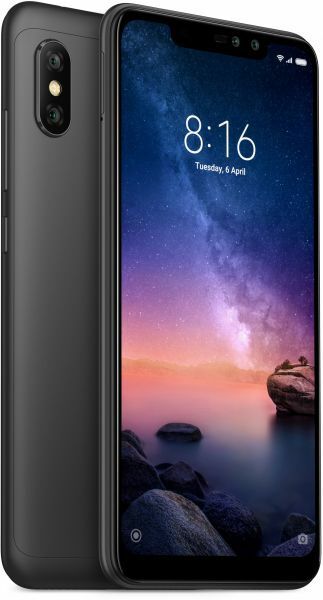 This Xiaomi Redmi Note 6 Pro smartphone comes with 4GB RAM and features a powerful Qualcomm SD636 Octa-Core processor to deliver an impressive performance. The processor performs every task smoothly while the 4GB RAM ensures you of a smooth multitasking experience. With 64GB internal memory, this smartphone offers extensive space for your everyday data storage needs. Watch your favorite content on the 6.26inch FHD plus display of this Xiaomi Redmi 4G LTE mobile phone. It renders crisp and vibrant images with incredible colors and breathtaking details, which is sure to give you an enjoyable viewing experience. This Xiaomi Redmi MI Note 6 pro smartphone is designed to give you a top class photography experience. It has 12MP plus 5MP dual camera for capturing high-resolution pictures and videos on the go. The 20MP plus 2MP dual selfie camera with dual pixel autofocus and LED flash functionality does the perfect job of taking selfies in varied lighting conditions. This Xiaomi Redmi 4GB RAM smartphone is crafted to perfection and looks brilliant. It has dual-SIM functionality that offers a simple and straightforward way of using two SIMs in your mobile phone, simultaneously. This mobile phone has support for 4G LTE connectivity that provides a fast internet connection. Furthermore, it includes a long-lasting 4000mAh battery that will easily carry you from sunup to sundown without any hassle. All the more, this high-end smartphone has a fingerprint sensor at the back that lets you unlock your smartphone with a simple touch.